Proclaimed one of nuclear energy’s worst financial setbacks, the Marble Hill project of the late 1970s was meant to be Indiana’s first and only nuclear power plant, but it was doomed by corruption, embarrassingly miscalculated expense, and ever-decreasing public support for nuclear energy. It’s located along the Ohio River, about 45 minutes outside of Louisville near the towns of Nabb and Madison, Indiana. Had it been completed, the facility would’ve been architecturally similar to the Byron Nuclear Generating Station, which currently supplies power to Chicago. The Public Service Company of Indiana (PSI) began construction in 1977, and was met with a mixed response from the surrounding local communities including a number of protests by environmentalist advocacy organizations concerned about the dangers of nuclear energy. Still, the ambitious project provided a ton of jobs for local contractors and construction workers, so many locals were in favor of it. American novelist and activist Wendell Berry shares his experience as one of 89 arrested for protesting Marble Hill. But, by 1979, former employee Charles Cutshaw filed an affidavit claiming that he and other construction workers were instructed to hide potentially catastrophic defects in the structure during regular inspections after using an improper mixture of concrete in the containment building. These accusations only managed to stall the construction, prompting a series of investigations by Congress and the Nuclear Regulatory Commission as well as further unforeseen expense due to the delays. Even amid what PSI itself referred to as a “cash emergency,” construction began again 19 months later. Inevitably, the unexpected cost became too overwhelming, and even financial support from the state of Indiana wouldn’t be enough to finish what PSI had started. 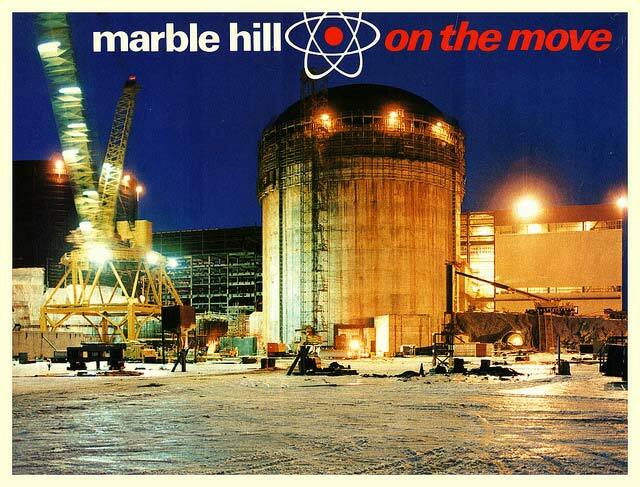 The reactors were 55% and 35% complete when PSI chairman Hugh Barker proclaimed Marble Hill “no longer politically or financially feasible.” 3500 construction workers lost their jobs, and $2.5 billion had already been spent, rendering the project one of the most expensive failures of its time. Unemployment rates in the region soared, requiring more than two years to normalize after the plant was abandoned. It was one of over 100 nuclear power plant projects cancelled in the wake of the 1979 accident at Pennsylvania’s Three Mile Island. For $3.5 million, what’s left of the once promising project can be all yours, and it isn’t even radioactive (since it was never used). Any nuclear technology of value was stripped and sold at bottom dollar in the late ’80s after its cancellation, and demolition of the numerous structures on the property started as early as 2005. Though the turbine and fuel handling buildings were leveled in 2007, as well as one of the containment buildings in 2010, there are still a small number of skeletal structures congregated on the property to visit today. Perhaps one day, efficient nuclear energy will make its comeback, but it’ll be a long time before the accident at Three Mile Island and disasters like Chernobyl and Fukushima fade far enough from public memory to continue building facilities like Marble Hill. Fascinating! Thanks for sharing all the history, along with the fabulous photos! I’ve lived in Indiana all my life, nearly 50 years, and while I’ve heard of this place (it was not avoidable while it was in the news), I never knew it was down by Madison. It has a haunting appearance despite the lack of happy or unhappy ghosts or memories. Thank you Heide!! Yeah I think $3.5 million is waaay too high. Not only are the buildings not really convertible to living space, it’s really remote, too.